Identities are an evolution of Sessions and will live alongside them. Even for users who have used Sessions heavily, we think that most users will find Identities to be their new 'go to' for managing multiple accounts since they will store many of your settings including Proxy and UA string settings. With Sessions, cookie jars are temporary and have colors pre-selected by us. Identities, on the other hand, allow you to choose a custom color and are permanent. Another way to think about Identities is if you want to be sure you never cross-client accounts on Google or Social Media, you can use a different Identity for each client to keep them straight. Tab Colors 15 colors are pre-selected for you and that limits that number of Sessions you can have per Task. You select the colors for all of your tabs so you can select more meaningful colors. Global Across Tasks Not global. A purple tab in one Tasks has a separate cookie jar from purple tabs in other Tasks. Global. Identity tabs share the same cookie jar no matter what Task they are in. 2. Enter a name for your Identity. 3. 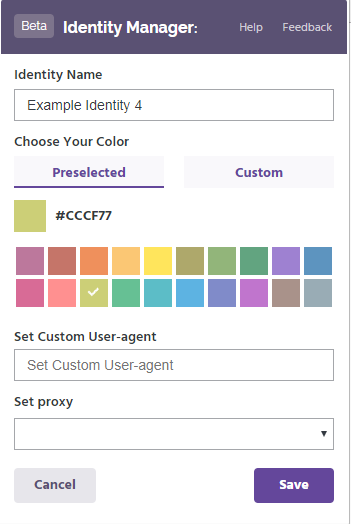 To select your color preference you can either choose Preselected Color or Custom Color Options. 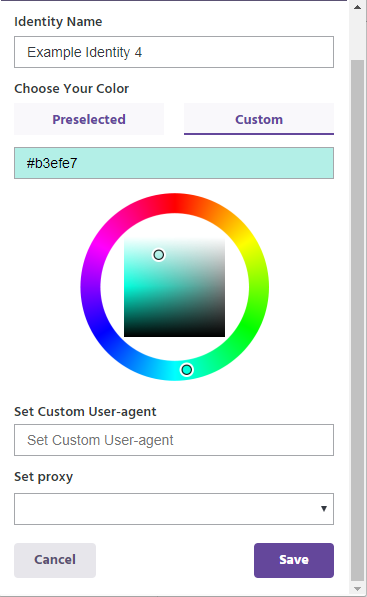 3.2 To use Custom Colors you need to either enter a HEX number or drag the color selector on the outer wheel to select your color and then drag the color selector on the inner square to customize the color. Click Save to set the name and color of your Identity. 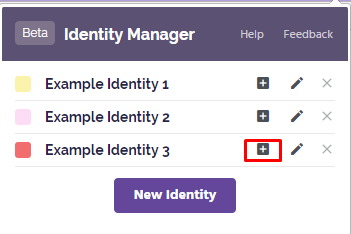 To open a tab in your new Identity, click the plus icon to the right of the Identity name. If you want to edit the name or color of an Identity click the pencil icon to the right of the Identity name in the menu. If for any reason you want to delete an Identity from your list click the X icon to the right of the Identity name in the menu. A message will appear asking you to confirm you want to delete the Identity. NOTE: Deleting an Identity will permanently remove the cookies from that Identity from the browser. This action cannot be undone. You will not be able to get the cookies back once you delete the Identity. 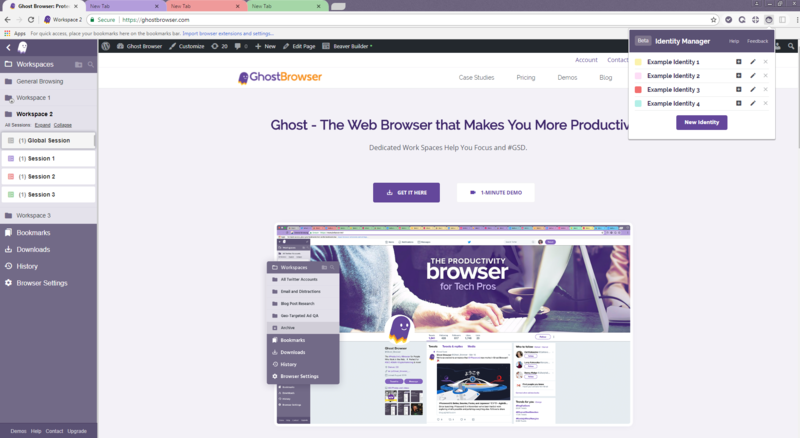 Before you can assign a proxy to your Identity, you need to upload proxies to the Ghost Proxy Control extension. 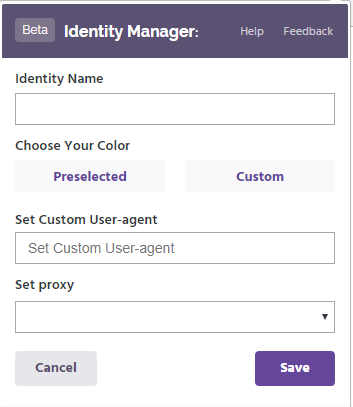 After you have added proxies to the Ghost Proxy Control extension follow the instructions below to assign a proxy to an Identity. 1. Click the Identities icon in your extension tray to open the menu. 2. Click the Set Proxy link under the desired Identity. 3. Click the drop-down menu to select the desired proxy. The proxy is now assigned to the Identity. 4. To edit the proxy assigned to an Identity simply click on the link with the proxy name to select a new proxy. You can assign a custom UA string to each Identity. 2. Click Edit the Identity and Set Custom User Agent string. 3. Paste full user agent string into the box and hit Save. 4. You can get the latest User Agent strings from this web site.